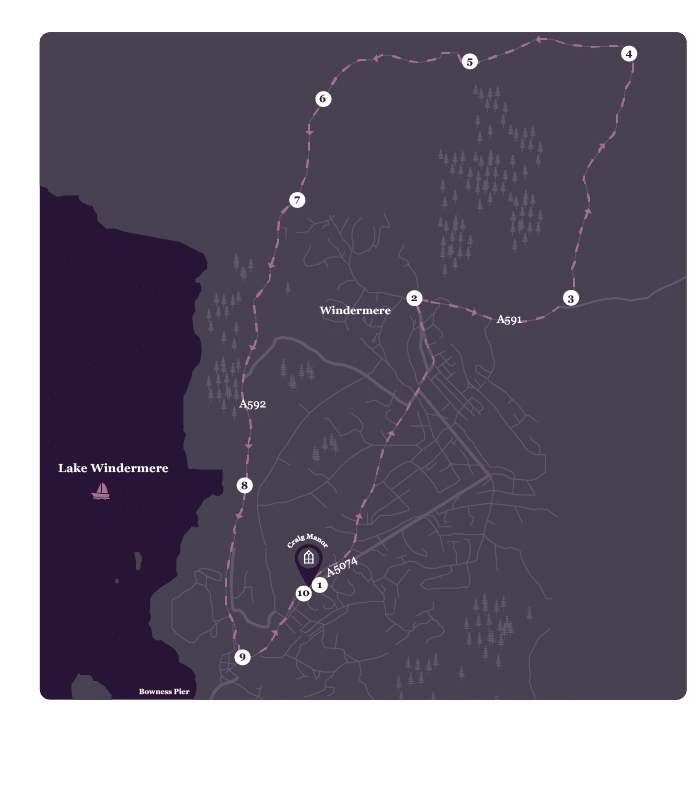 Trail description: This walk will take you up through the small town of Windermere, up towards Wynlass Beck and in a circular route back around to Bowness. There are plenty of opportunities for great views over Windermere and lots of places to stop off for a break. Trail Notes: Taking just under 2 hours, this walk is mostly on roads and will go down a few narrow lanes. It should be suitable for most walkers but can easily be cut short by turning left at Point 2 and turning left at the roundabout on Rayrigg Road (Point 7). Start by heading North up Lake Road (A5074) towards Windermere town centre, passing the Police Station on your right hand side. Keep following the road straight. It will bend slightly to the left as you enter Windermere Town centre. As soon as you reach Church Street (A591), which is the main road, turn right. Carry on down Church Street, passing Windermere railway station on the right hand side. After half a mile, turn left down a narrow country lane. You will be able to identify which is the correct turning, as there is a white sign for Common Farm attached to a tree. Follow the lane, keeping to the left at all times. You will eventually encounter a cross roads with a bench on the right hand side. Feel free to take a break before turning left here. Continue down the narrow lane, passing Orrest Farm and Wynlass Beck on your right hand side. The lane will eventually veer to the left as you pass Crosses Farm, and join up with Patterdale Road (A592). Turn left here. Carry straight on at a roundabout that crosses Ambleside Road, following the sign for the World of Beatrix Potter. Continue down Rayrigg Road for 1.5 miles, passing Windermere Outdoor Adventure Centre and Rayrigg Wyke on your right hand side. Arriving back into Bowness, you will see the World of Beatrix Potter on your left hand side. Soon after this, make a left at the end of the road. Half a mile up the road, you will arrive back at Craig Manor. An educational centre owned by the National Trust, The Footprint is the first building in Cumbria to be made of straw bales. It offers courses for young and old including bushcraft, woodworking, hammock camps and yoga. You can also explore the area surrounding St Catherine’s estate and truly reconnect with nature. There is tons to see and do in this small town centre, including cafés, restaurants, tour companies, libraries and even a train station that can take you to other great locations in the Lake District. If in doubt, pop in to the Tourist Information Centre for more ideas.